Easy tips for how to grow cauliflower when home vegetable gardening. Learn how to plant and grow cauliflower in your backyard garden. 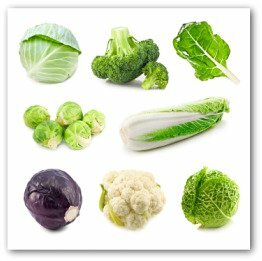 Cauliflower is a member of the cabbage or brassica family of cool-season vegetables. If you grow extra cauliflower in your garden, it can easily be blanched and frozen for winter use. One of the first steps in finding out how to grow cauliflower is knowing where to plant the vegetable. The plants prefer a location that receives full sun exposure. The garden bed should be made up of enriched, moist, well-drained soil with a pH of 6.0 to 7.0. The soil for growing cauliflower needs adequate amounts of trace elements, particularly boron because the plants are very sensitive to boron deficiency. Soils rich in organic matter are rarely boron deficient. However, boron may be unavailable to plants in soils that are strongly alkaline. Maintaining soil pH close to the recommended ranges ensures the availability of boron to the cauliflower plants. Good sources of the trace element are rock phosphate and granite dust. Prior to planting, work in both of these materials along with a lot of compost. Cauliflower is an extremely greedy feeder, requiring a steady supply of nitrogen to permit it to grow as quickly as possible to maturity. 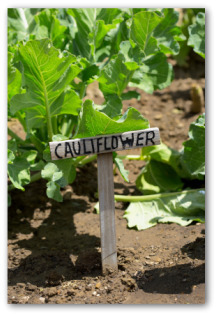 Cauliflower can be grown successfully during the wintertime in the mild winter climates of Zones 7 to 10. The plants grow best when temperatures average 60 to 65 degrees. 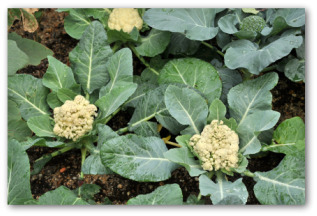 Plant cauliflower to mature in the springtime, before summer heat sets in. Alternatively, many gardeners plant in fall after the hot weather subsides. Start spring crops from seed indoors 6 to 8 weeks before the average last frost date.Set out transplants 2 to 4 weeks before the last frost date. For fall crops sow seeds in pots or flats 12 weeks before the first expected autumn frost. Set out transplants 4 weeks later. Cauliflower seeds germinate best at a soil temperature of 70 to 75 degrees. Alternatively, seeds for a fall crop may also be sown directly in the vegetable garden 12 weeks before the average date of your first autumn frost. Sow seeds a half inch deep. Transplants should be large enough to have three true leaves when they are planted in the garden. A small bud in the center of the plant should also be present; where the head will form. Space plants or thin seedlings to stand 2 feet apart in rows 3 feet apart. In beds, spacing should be 18 inches in all directions. Thin seedlings when plants are 1 inch high. Keep a sharp eye out for cabbage worms that are trying to take a bite out of your tasty vegetables. You have to look closely when handpicking these garden pests because they camouflage themselves by stretching out along leaf veins on cauliflower leaves. Below is an organic remedy to wipe out cabbage worms. Mix the two ingredients together.Sprinkle all over your cauliflower to give them a good coating.This mixture will keep the worms far away from your plants.The ones that get away will be easy to spot and pluck by the trail of powdery residue they leave behind! Spring crops are harder to grow because of timing the start of hot weather. If you are discovering how to grow cauliflower for the first time, it may be best to begin by planting a fall crop. Plant fast growing crops such as radishes and lettuce between young cauliflower plants to make the most of your gardening space. To reduce the risk of the plant disease clubroot, avoid planting cauliflower where it or other cabbage family members grew last year. 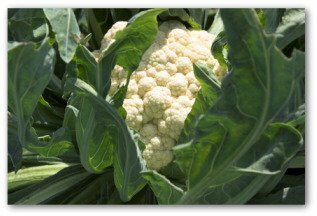 Self-blanching cauliflower varieties will produce white heads without the traditional gardening practice of tying the leaves together.